It goes by a few names–បុណ្យចូលឆ្នាំថ្មី, Chaul Chnam Thmey, or simply the Cambodian New Year–but the inauguration of the event in Long Beach is one steeped in a single tradition that has spanned two decades, with this year welcoming the Year of the Snake. Though the Cambodian community welcomed 2557 BE (or what is known as Buddhist Era, the renumbered Gregorian calendar of Thailand) during a three-day celebration that began at temples and in private homes on April 13, the Cambodian Coordinating Council (CAM-CC) will have an all-day, open-to-the-public New Year’s celebration this upcoming Saturday at El Dorado Park. Welcoming the Cambodian New Year is one of the most important holidays in Cambodian culture, whose stronghold in Central Long Beach has made it one of the most vibrant and dynamic neighborhoods in the city. The event itself is traditionally spread over the course of three days. The first, មហាសង្រ្កាន្ត or Maha Songkran, usually involves dressing up, lighting candles, and paying homage to the teachings of the Buddha. Virak Wanabat or វិរ:វ័នបត is the second day, where charity is offered to those in need, particularly the homeless, servants, and low-income homes. The last and final day, ថ្ងៃឡើងស័ក or T’ngai loeurng Saka, involves the cleansing of Buddha statues with perfumed water while children bathe their elders, including parents and grandparents. 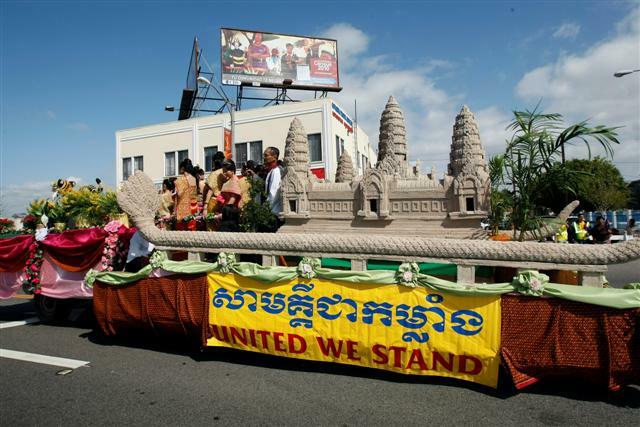 For several years, Long Beach held a parade along Anaheim in Cambodia Town, which offers a large benefit to the many restaurants and shops that line the street since thousands often attend. However, due to an admitted lack of organization and funds, was unable to do so this year as well as last–an alarm that made many in the community question what precisely was going on. Chavarria has now insisted that fundraising for next year will not only begin next month, but there will most certainly be a parade at next year’s celebration. 6th District Councilmember Dee Andrews echoed this promise at the dedication ceremony for the new Cambodia Town light post banners. “We’ll have a parade next year, even if it’s just the mayor and me walking the streets alone,” he said. 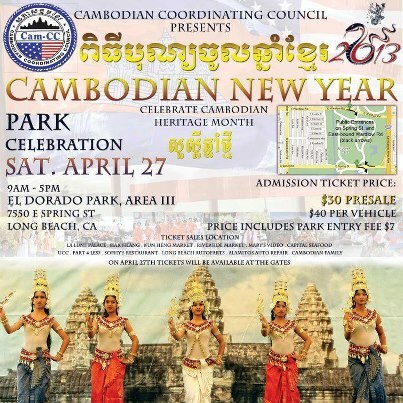 The CAM-CC’s Cambodian New Year Celebration is expected to draw more than 10,000 people to El Dorado Park this weekend and organizer Tony Te says they have sold tickets to people traveling from as far away as Florida and New York. In addition to traditional dances, music and entertainment, the event will also have a Cambodian food court as well as an “Emerging Leaders of the Future” presentation which will recognize young people who are contributing to the Cambodian culture in Long Beach. The Cambodian New Year Celebration will take place at El Dorado Park Regional Park, Area III on Saturday, April 27, from 9AM to 5PM. Tickets are required for admission to El Dorado Park. If purchased before the event, the price is $30 per vehicle presale, $40 at the door. Tickets are available at a number of Cambodian restaurants and other businesses throughout Long Beach. Click here for a complete list of ticket sellers as well as the registration form for booths. For more information, please contact Tony Te at (562­) 212-­5936 or [email protected]­cc.org.